CHARLOTTE, NC (01/21/16) —Veteran Women Igniting the Spirit of Entrepreneurship (V-WISE), the nation’s leading entrepreneurship training program for women veterans, active duty service women, and female partners and spouses of service members, is hosting a national entrepreneurship training conference in Charlotte, January 29-31, 2016. More than 200 innovative women veterans and military spouses will converge on the City of Charlotte to learn business best practices, build networks, and develop their entrepreneurial skills as they seek to launch or grow sustainable business ventures. General Janet Wolfenbarger, a retired four-star general with 35 years of service in the United States Air Force, and the first woman to achieve the rank of General in the Air Force. Connie Mariano, retired United States Navy, and the first woman military physician to serve in the White House under three presidents. 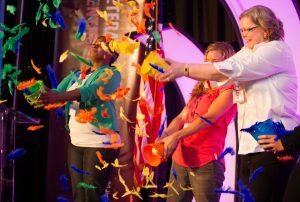 At each V-WISE Conference, women from the military and from across society, are recognized for their career accomplishments and societal contributions. Past FIRST honorees include Colonel Jill Willig Chambers, Lieutenant General Flora D. Darpino, Major General Marcia Anderson, Lieutenant General Patricia Horoho, General Ann Dunwoody, Major General Gina Farrisee, and Master Chief Ginger Simpson. V-WISE was created by the Institute for Veterans and Military Families (IVMF) and the Martin J. Whitman School of Management at Syracuse University in partnership with the U.S. Small Business Administration (SBA). Attendees of the conference will receive in-depth instruction from prominent business owners, leadership consultants, educators, veterans and other experts who will help shape their development as entrepreneurs. Sessions will focus on business planning, marketing, accounting/finance, business law, technology for business, human resources and government contracting. Neale S. Godfrey, Founder & CEO, Children’s Financial Network, Inc.
Nicole is a military spouse. She and her husband, John Mahshie, who was honorably discharged from the Air Force in 2004, are no strangers to small business and entrepreneurship training. They are founders of Veterans Healing Farm, in Hendersonville, NC, which they started in 2013, and are prior students of IVMF’s entrepreneurship and small business training programs. Veterans Healing Farm fosters a thriving micro-community of local veterans and civilians who build deep friendships, implement innovative gardening techniques, and help cultivate emotional, physical, and spiritual health. The goal is to personally empower vets through the realization that their own efforts and contributions are important to our community. Nicole and John are both graduates of IVMF’s Entrepreneurship Bootcamp for Veterans with Disabilities (EBV) programming, with John graduating from EBV at Florida State University in 2013, and Nicole graduating from the EBV-Families program at Syracuse University in 2014. They both attended the EBV National Convention in Atlanta in 2015, where they pitched their business plan and won Best Overall Venture and Best Venture Supporting Veterans … and $35,000 to put towards their business! “Those winnings allowed us to grow by leaps and bounds in 2015 … and, in 2016, we are hiring our first staff members (an Army veteran and a Coast Guard veteran),” says Nicole, who in addition to attending V-WISE in Charlotte, will also be attending the 2016 EBV National Training and Alumni Conference in Charlotte the following weekend (Feb. 5-7) with her husband John. Dr. Stephannie Addo-Zuniga is an Army veteran, who was honorably discharged in 2006. Trained as an Army automotive logistics specialist, Stephanie now serves as a business coach and is preparing to launch a business venture titled Champs for Autism. Dr. Addo shares that according to the New York State Department of Education, there are currently 877 government funded private schools in New York state but only 107 are geared towards Autism. Out of those 107 private schools in New York state, only 27 are in New York City, with none operating out of the Bronx. As a parent of an Autistic child, Dr. Addo has experienced many hardships and her eight-year old child has been placed on many waiting list in order to get the services that he needs. She feels that Champs for Autism will provide the services needed to children on the Autism spectrum that are at a disadvantage due to their economic status or because of where they live. By offering tuition on a sliding scale, Champs for Autism will give parents in the Bronx an option to choose private school or public school. In addition to attending V-WISE Charlotte, Stephannie will also be attending the 2016 EBV National Training and Alumni Conference, to be held in Charlotte, NC, Feb. 5-7, 2016. She is a past graduate of IVMF’s Entrepreneurship Bootcamp for Veterans with Disabilities (EBV) at UConn in 2014. Learn more about V-WISE and to apply online for future conferences. Since its founding on July 30, 1953, the U.S. Small Business Administration has delivered millions of loans, loan guarantees, contracts, counseling sessions and other forms of assistance to small businesses. SBA provides assistance primarily through its four programmatic functions: Access to Capital (Business Financing); Entrepreneurial Development (Education, Information, and Technical Assistance & Training); Government Contracting (Federal Procurement); and Advocacy (Voice for Small Business). The SBA’s Office of Veteran Business Development formulates, executes and promotes policies and programs to empower veteran small business ownership and serves as an ombudsman for Veterans to ensure all SBA programs are accessible to servicemembers, veterans, and their families. For more information visit SBA and SBA for Vets.